Individually and/or in a group environment. We offer an assessment methodology with a systematic evaluation point of view that mixes quantitative and qualitative competencies. The Information is matched and compared with the results obtained in different case studies and analysis, through the implementation of different conceptual models for the resolution of critical situations. With all this we measure critical thinking, emotional intelligence, argumentation skills and objectivity in decision making, flexibility before innovation, resilience, diversity and sustainability. We identify the current level of critical competency required and the potential capability of each person to understand major complexities in a role and perform successfully, within a specific time, in high management positions. We evaluate the critical thinking and the strategic capability; the resources that every person uses for decision-making, negotiating and leadership. Our process includes feedback, coaching and personalized action plan for everyone that is evaluated. As a final synthesis, we hand in a systemic map of the evaluated team. Certified under Lominger Korn Ferry International tools, we measure the 21 successful factors and 5 types of managing careers, as well as a competent global approach. 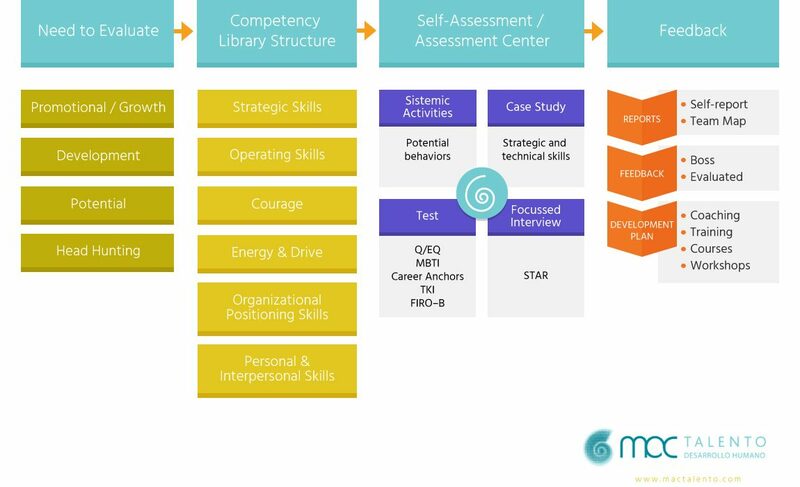 This process includes measurement, feedback and 4 coaching encounters. Based on these, and according to the client’s needs we select the most suitable tests. Our team is formed by professionals with Psychology and General Education Psychology degrees.